Shree Vasant – Just before leaving on his first visit to USA. 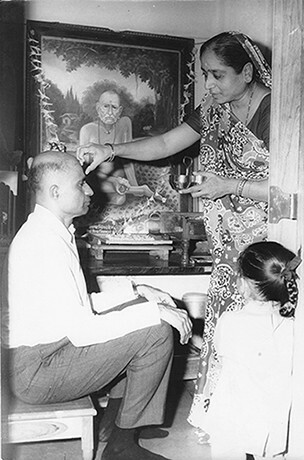 Shree Gajanan Maharaj gave a command to Shree Vasant to start an NGO with the name ‘Fivefold Path Mission’, an educational and cultural trust. And then Fivefold Path Mission was formed on 12th August 1976. Shree Gajanan Maharaj commanded Shree Vasant to open a Center near Parola, Dist- Jalgaon, Maharashtra. Which would later on become Tapovan. Shree Gajanan Maharaj had commanded Shree Vasant that after completion of his work he shall come and stay on the bank of river Narmada in Maheswar. So accordingly he chose a place 4 kms from Maheshwar near village Ladvi on the bank of river Narmada, named ‘Homa Therapy Goshala’. In the year 2007, Shree Vasant started a series of Seven Somayags in Goshala. And all the seven Somayags were completed by the year 2017. Shree Vasant left his body on 30th December, 2008.